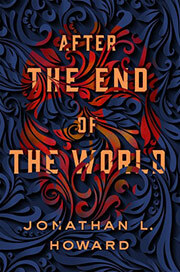 Howard, Jonathan L. After the End of the World . Thomas Dunne 2017. What if: Nazi Germany destroyed Moscow with an "atomic" bomb in 1941. Summary: Lovecraftian novel set in the present day of the "Unfolded World", which is dominated by Nazi Germany, and involving what appears to be a Zero Point Energy experiment jointly conducted by scientists from Miskatonic University and from Germany,. Series note: Second in the Carter & Lovecraft series. Comments: Although the predessor novel, Carter & Lovecraft , is not allohistorical, reading it provides a useful background to understanding what is happening in this volume. Published: Thomas Dunne 201 (1250060907BUY).